I tied on a new warp to my dishtowel warp. 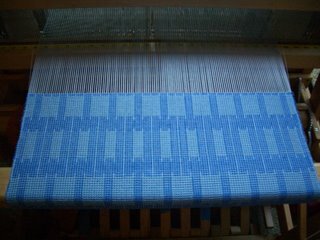 This time using a thinner warp [a light blue 20/2 perle cotton] and a pattern weft with a great disparity with the warp. I used 3/2 perle cotton for the pattern weft in two lovely values of blue. This is more to the standard nature of summer and winter than what I did on the dishtowels where all the yarn used was the same size. I was going to tie on enough to do two 5-6 feet runners...but the warp was a dog...and I ended up cutting off perhaps half or more and tossing it. This is the first time, I 'dogged' a warp. I usually have enough patience to work out the mess. Not this time. The pattern is based on an alternative treadling to my dishtowels. It's from the Stickler 8 harness pattern book on page 159. The good thing about this pattern is that there are no color/shuttle changes. I get to use the same three shuttles through out the piece. Those dishtowels required a color change twice within each 250 pic pattern repeat. I like the result in dukagang. Although it doesn't quite look like the pattern in the book. I suspect I need a somewhat thicker warp/tabby to get the same look - perhaps a 10/2 cotton. I like the blue variation you have going.